Montparnasse (French pronunciation: ​[mɔ̃paʁnas]) (French (help·info)) is an area of Paris, France, on the left bank of the river Seine, centered at the crossroads of the Boulevard du Montparnasse and the Rue de Rennes, between the Rue de Rennes and boulevard Raspail. Montparnasse has been part of Paris since 1669. Tour Montparnasse, a lone skyscraper. The Pasteur Institute is located in the area. Beneath the ground are tunnels of the Catacombs of Paris. Students in the 17th century who came to recite poetry in the hilly neighbourhood nicknamed it after "Mount Parnassus", home to the nine Muses of arts and sciences in Greek mythology. The hill was levelled to construct the Boulevard Montparnasse in the 18th century. During the French Revolution many dance halls and cabarets opened their doors. The area is also known for cafés and bars, such as the Breton restaurants specialising in crêpes (thin pancakes) located a few blocks from the Gare Montparnasse. In the 18th century, students recited poems at the foot of an artificial hillock of rock rubble from the catacombs, a near-by network of underground galleries. Ironically, they decided to baptize this mound "Mount Parnassus", named after the one celebrated by Greek poets. In early 20th century, many Bretons driven out of their region by poverty arrived by train at Montparnasse station, the heart of the district, and settled near-by. Montparnasse became famous in the 1920s, referred to as les Années Folles (the Crazy Years), and the 1930s as the heart of intellectual and artistic life in Paris. From 1910 to the start of World War II, Paris' artistic circles migrated to Montparnasse as alternative to the Montmartre district which had been the intellectual breeding ground for the previous generation of artists. The Paris of Zola, Manet, France, Degas, Fauré, a group that had assembled more on the basis of status affinity than actual artistic tastes, indulging in the refinements of Dandyism, was at the opposite end of the economic, social, and political spectrum from the gritty, tough-talking, die-hard, emigrant artists that peopled Montparnasse. Virtually penniless painters, sculptors, writers, poets and composers came from around the world to thrive in the creative atmosphere and for the cheap rent at artist communes such as La Ruche. Living without running water, in damp, unheated "studios", seldom free of rats, many sold their works for a few francs just to buy food. Jean Cocteau once said that poverty was a luxury in Montparnasse. First promoted by art dealers such as Daniel-Henry Kahnweiler, today works by those artists sell for millions of euros. at La Rotonde, by Cocteau, 1916. In post-World War I Paris, Montparnasse was a euphoric meeting ground for the artistic world. Fernand Léger wrote of that period: "man…relaxes and recaptures his taste for life, his frenzy to dance, to spend money…an explosion of life-force fills the world." They came to Montparnasse from all over the globe, from Europe, including Russia, Hungary and Ukraine, from the United States, Canada, Mexico, Central and South America, and from as far away as Japan. Manuel Ortiz de Zárate, Camilo Mori and others made their way from Chile where the profound innovations in art spawned the formation of the Grupo Montparnasse in Santiago. 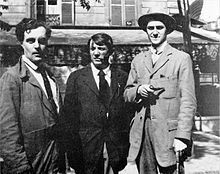 A few of the other artists who gathered in Montparnasse were Jacob Macznik, Pablo Picasso, Guillaume Apollinaire, Ossip Zadkine, Julio Gonzalez, Moise Kisling, Jean Cocteau, Erik Satie, Marios Varvoglis, Marc Chagall, Nina Hamnett, Jean Rhys, Fernand Léger, Jacques Lipchitz, Max Jacob, Blaise Cendrars, Chaim Soutine, James Joyce, Ernest Hemingway, Michel Kikoine, Pinchus Kremegne, Amedeo Modigliani, Ford Madox Ford, Toño Salazar, Ezra Pound, Max Ernst, Marcel Duchamp, Suzanne Duchamp-Crotti, Henri Rousseau, Constantin Brâncuși, Paul Fort, Juan Gris, Diego Rivera, Federico Cantú, Angel Zarraga, Marevna, Tsuguharu Foujita, Marie Vassilieff, Léon-Paul Fargue, Alberto Giacometti, René Iché, André Breton, Alfonso Reyes, Pascin, Nils Dardel, Salvador Dalí, Henry Miller, Samuel Beckett, Emil Cioran, Reginald Gray, Endre Ady poet and journalist, Joan Miró, Hilaire Hiler and, in his declining years, Edgar Degas. Montparnasse was a community where creativity was embraced with all its oddities, each new arrival welcomed unreservedly by its existing members. When Tsuguharu Foujita arrived from Japan in 1913 not knowing a soul, he met Soutine, Modigliani, Pascin and Léger virtually the same night and within a week became friends with Juan Gris, Picasso and Matisse. In 1914, when the English painter Nina Hamnett arrived in Montparnasse, on her first evening the smiling man at the next table at La Rotonde graciously introduced himself as "Modigliani, painter and Jew". They became good friends, Hamnett later recounting how she once borrowed a jersey and corduroy trousers from Modigliani, then went to La Rotonde and danced in the street all night. Between 1921 and 1924, the number of Americans in Paris swelled from 6,000 to 30,000. While most of the artistic community gathered here were struggling to eke out an existence, well-heeled American socialites such as Peggy Guggenheim, and Edith Wharton from New York City, Harry Crosby from Boston and Beatrice Wood from San Francisco were caught in the fever of creativity. Robert McAlmon, and Maria and Eugene Jolas came to Paris and published their literary magazine Transition. Harry Crosby and his wife Caresse would establish the Black Sun Press in Paris in 1927, publishing works by such future luminaries as D. H. Lawrence, Archibald MacLeish, James Joyce, Kay Boyle, Hart Crane, Ernest Hemingway, John Dos Passos, William Faulkner, Dorothy Parker and others. As well, Bill Bird published through his Three Mountains Press until British heiress Nancy Cunard took it over. Cafés rented tables to poor artists for hours at a stretch. Several, including La Closerie des Lilas, remain in business today. The cafés and bars of Montparnasse were a meeting place where ideas were hatched and mulled over. The cafés at the centre of Montparnasse's night-life were in the Carrefour Vavin, now renamed Place Pablo-Picasso. In Montparnasse's heyday (from 1910 to 1920), the cafés Le Dôme, La Closerie des Lilas, La Rotonde, Le Select, and La Coupole—all of which are still in business— were the places where starving artists could occupy a table all evening for a few centimes. If they fell asleep, the waiters were instructed not to wake them. Arguments were common, some fuelled by intellect, others by alcohol, and if there were fights, and there often were, the police were never summoned. If you couldn't pay your bill, people such as La Rotonde's proprietor, Victor Libion, would often accept a drawing, holding it until the artist could pay. As such, there were times when the café's walls were littered with a collection of artworks, that today would make the curators of the world's greatest museums drool with envy. There were many areas where the great artists congregated, one of them being near Le Dôme at no. 10 rue Delambre called the Dingo Bar. It was the hang-out of artists and expatriate Americans and the place where Canadian writer Morley Callaghan came with his friend Ernest Hemingway, both still unpublished writers, and met the already-established F. Scott Fitzgerald. When Man Ray's friend and Dadaist, Marcel Duchamp, left for New York City, Man Ray set up his first studio at l'Hôtel des Ecoles at no. 15 rue Delambre. This is where his career as a photographer began, and where James Joyce, Gertrude Stein, Jean Cocteau and the others filed in and posed in black and white. The rue de la Gaité in Montparnasse was the site of many of the great music-hall theatres, in particular the famous "Bobino". Great artists performed at the Bobino Nightclub. On their stages, using then-popular single name pseudonyms or one birth name only, Damia, Kiki, Mayol and Georgius, sang and performed to packed houses. And here too, Les Six was formed, creating music based on the ideas of Erik Satie and Jean Cocteau. The poet Max Jacob said he came to Montparnasse to "sin disgracefully", but Marc Chagall summed it up differently when he explained why he had gone to Montparnasse: "I aspired to see with my own eyes what I had heard of from so far away: this revolution of the eye, this rotation of colours, which spontaneously and astutely merge with one another in a flow of conceived lines. That could not be seen in my town. The sun of Art then shone only on Paris." While the area attracted people who came to live and work in the creative, bohemian environment, it also became home for political exiles such as Vladimir Lenin, Leon Trotsky, Porfirio Diaz, and Simon Petlyura. But, World War II forced the dispersal of the artistic society, and after the war Montparnasse never regained its splendour. Wealthy socialites like Peggy Guggenheim, an art collector who married artist Max Ernst, lived in the elegant section of Paris but frequented the studios of Montparnasse, acquiring pieces that would come to be recognized as masterpieces that now hang in the Peggy Guggenheim Museum in Venice, Italy. The Musée du Montparnasse opened in 1998 at 21 Avenue du Maine and closed in 2015. Although operating with a tiny city grant, the museum was a non-profit operation. SNCF, the French rail company, has its head office in Montparnasse near the 14th arrondissement. Prior to the completion of the current Air France head office in Tremblay-en-France in December 1995, Air France was headquartered in a tower located next to the Gare Montparnasse rail station in Montparnasse and in the 15th arrondissement; Air France had its headquarters in the tower for about 30 years. The Vandamme Library (Bibliothèque Vandamme) is located in the neighbourhood. ^ "Montparnasse". Paris Digest. 2018. Retrieved 13 August 2018. ^ "Legal information." SNCF. Retrieved 26 October 2009. ^ "Le siège haut perché de la SNCF à Montparnasse[permanent dead link]." Les Echos. 20 May 1999. Page 54. Retrieved 1 May 2010. "Pari tenu : réceptionné le 19 mars par Bouygues Immobilier et livré à son occupant dix jours plus tard, le nouveau siège de la SNCF est sorti de la gangue du grand ensemble de la gare Montparnasse, dans le 14e arrondissement de Paris, en quinze mois d'un chantier intense qui a mobilisé sur place jusqu'à 650 personnes. Quelque 800 postes de travail sont concernés sur les 2.500 qui gravitaient hier autour du siège historique de Saint-Lazare (9e arrondissement), consacrant la partition entre une direction générale resserrée et des services centraux pléthoriques." ^ "AIR FRANCE HEAD QUARTERS – ROISSYPOLE." Groupement d'Etudes et de Méthodes d'Ordonnancement (GEMO). Retrieved 20 September 2009. ^ "Roissy Charles-de-Gaulle." Tremblay-en-France. Retrieved 20 September 2009. ^ Salpukas, Agis (27 December 1992). "Air France's Big Challenge". The New York Times. Retrieved 31 May 2009. ^ World Airline Directory. Flight International. 20 March 1975. "466. ^ Mlekuz, Nathalie. "Air France vole vers ses avions, destination Roissy". Le Monde. 2 April 1997. Retrieved 22 September 2009. ^ "Bibliothèque Vandamme." City of Paris. Retrieved 22 February 2010. ^ "Des livres à domicile pour les seniors." Le Parisien. 11 August 2009. Retrieved 22 February 2010. "la bibliothèque Vandamme de l'avenue du Maine (Montparnasse, XIV e )." Billy Kluver, Julie Martin. Kiki's Paris: Artists and Lovers 1900–1930. The definitive illustrated account of the golden age of Montparnasse. Wikimedia Commons has media related to Montparnasse.